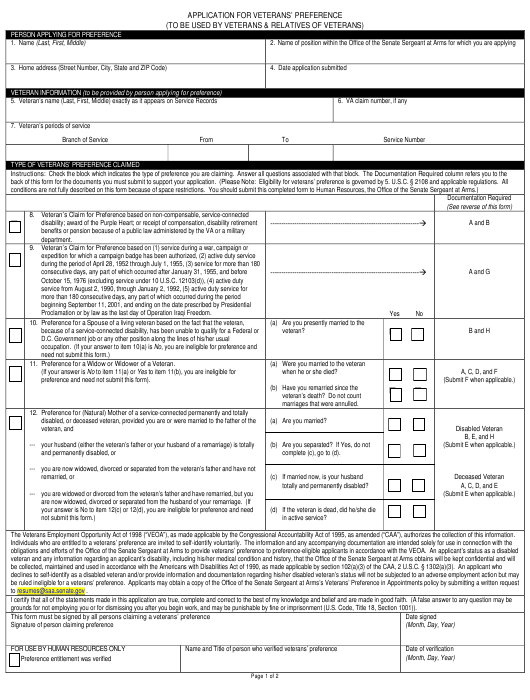 This printable "Application for Veterans' Preference" is a document issued by the U.S. Office of Personnel Management specifically for United States residents. Proclamation or by law as the last day of Operation Iraqi Freedom. 11. Preference for a Widow or Widower of a Veteran. when he or she died? preference and need not submit this form). complete (c), go to (d). The Veterans Employment Opportunity Act of 1998 (“VEOA”), as made applicable by the Congressional Accountability Act of 1995, as amended (“CAA”), authorizes the collection of this information. grounds for not employing you or for dismissing you after you begin work, and may be punishable by fine or imprisonment (U.S. Code, Title 18, Section 1001)). Please submit photocopies of documents because they will not be returned unless a certified copy is specified. 1. Honorable or general discharge certificate. 3. Orders of transfer to retired list. 4. Report of separation from a branch of the Armed Forces. Armed Forces, of death occurring under honorable conditions. 2. If death occurred while not on active duty, submit certified copy of death certificate. the Period of April 28, 1952, through July 1, 1955.
show that honorable separation took place. because of Her Husband’s Total and Permanent Disability. Documentation of Annulment of Remarriage by Widow or Widower of Veteran. compensation was restored due to annulment. 2. A certified copy of the court decree of annulment. compensation for a service-connected disability or disability retired pay. G. Documentation of Service During War or Certain Periods of Time. disability or was transferred to the permanent disability retirement list. separated for hardship or other reasons under 10 U.S.C. 1171 or 1173. 3) a notation as to whether the service-connected disability is rated as permanent and total. 1. Is the veteran currently working? If No, go to Item 3. 2. If currently working, what is the veteran’s present occupation? 3. What was the veteran’s occupation, if any, before military service? 5. Has the veteran been employed, or is he/she now employed, by the Federal civil service or D.C. Government? If Yes, submit documentation of the resignation, disqualification, or separation. 7. Is the veteran receiving a civil service retirement pension? If Yes, give the Civil Service annuity or Federal employee retirement annuity number.